"I do not like green eggs and ham. I do not like them, Sam-I-Am." "Try them, try them, and you may! Try them and you may, I say." Your dog is guaranteed to love this simple and delicious recipe from our canine chef friend Kirby the Dorkie. Your pup can eat them in a house, your pup can eat them with a mouse, your pup can eat them in a box, your pup can eat them with a fox, your pup can eat them here or there, your pup can eat them anywhere! Your pup will like green eggs and ham, your pup will like them Sam-I-Am! Made with eight ingredients, this colorful recipe will can be made in four easy steps are will be ready to eat in in less than an hour! You might even find yourself trying one when they come out of the oven because their aroma will fill your kitchen with a wonderful aroma. You might even find yourself making up rhymes like Dr. Seuss while you wait for them to bake! Using a food processor finely chop the spinach and ham. You can use frozen spinach but it just doesnt have the same abundance of nutrients found in fresh spinach. I purchased a 10 oz bag of fresh baby spinach leaves which yielded 2 cups finely chopped spinach. Thoroughly mix all ingredients in a large bowl. Scoop spoonfuls (I used a small cookie dough scooper) and place on a baking sheet. They can be placed close together since they won’t rise or spread while baking. Bake at 350 degrees for 30 minutes or until lightly browned on bottom edges. They can be stored in the refrigerator for about a week or in the freezer for up to 4 months. Kirby has a dry skin problem, so the addition of salmon and olive oils to his food and treats helps. "Extra light" olive oil will effect the flavor of the recipe less because it is lighter in flavor. Olive oil has many health benefits, but if you're worried about the amount of fat in this recipe, reduce the amount of oil used. 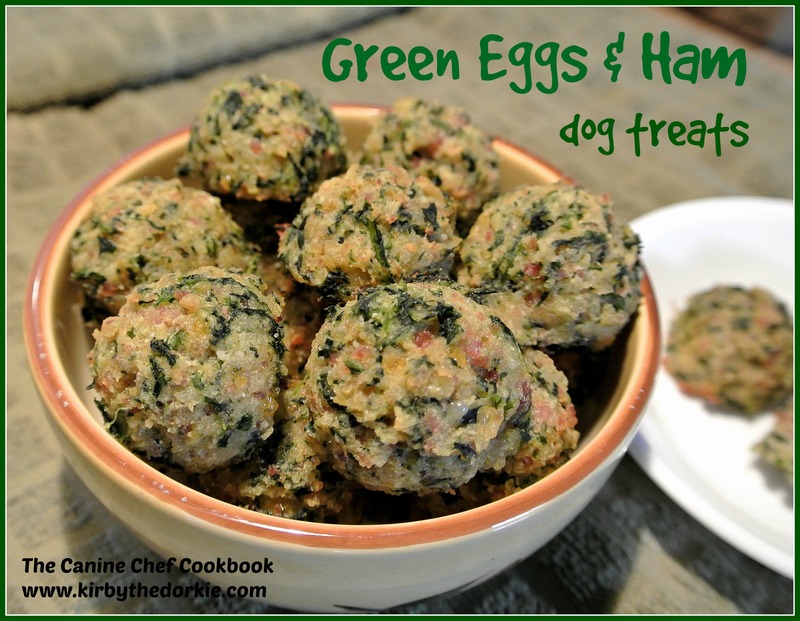 What do you think of this dog-friendly Green Eggs & Ham recipe? What ingredients would you want to use? Let us know in the comments below!